VietNamNet Bridge – The Police Department for High-tech Crime Prevention of Hanoi has identified the one who penetrated into the electronic communication software system of the Ha Dinh Primary School in Thanh Xuan District, Hanoi, to send false messages that made nearly 200 students absent from school. Two false messages sent to parents of students and the correction message of the school. A police officer said yesterday that the hacker was identified and he admitted guilt. "The hacker is an electronic communication software programmer for schools in Hanoi. Upon detecting a gap in the software that is used by Ha Dinh school, this person infiltrated and sent false messages to parents of students in order to destroy the reputation of the opponent company, which provided the software to Ha Dinh School," said the police officer. 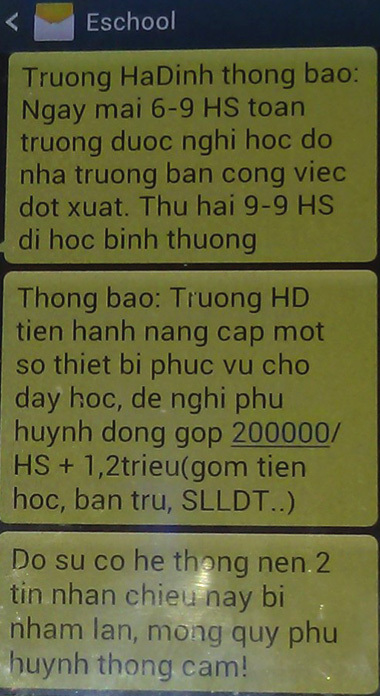 According to the Management Board of Ha Dinh Primary School, in the afternoon of September 5, after the opening ceremony of the new school year, parents received a message from the electronic communication system of the school with the content: "Ha Dinh School would like to notice that tomorrow, September 6, students are allowed to be off school because the school has unexpected work. Monday, September 9, students go to school as normal." The hacker then sent another message: "Notice: Ha Dinh School will upgrade some facilities for teaching. The parents are suggested to pay contribution of VND200,000/student + VND1.2 million (including tuition fees, boarding fees,... )". "These messages were not sent by the school. The messages have affected the school’s reputation and student’s parents. Though we promptly detected and sent a correction message to the parents, nearly 200 students were absent from school on September 6," said the school administrators. Because the similar incident occurred in some schools in the area, Ha Dinh School reported it to the police for investigation.